Politics | Full. Body. Transplant. 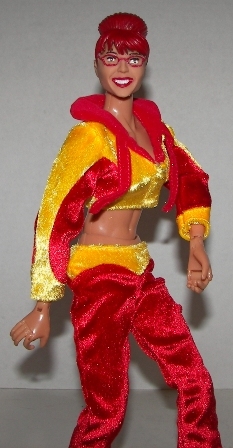 Sarah Palin is more than just an action figure. 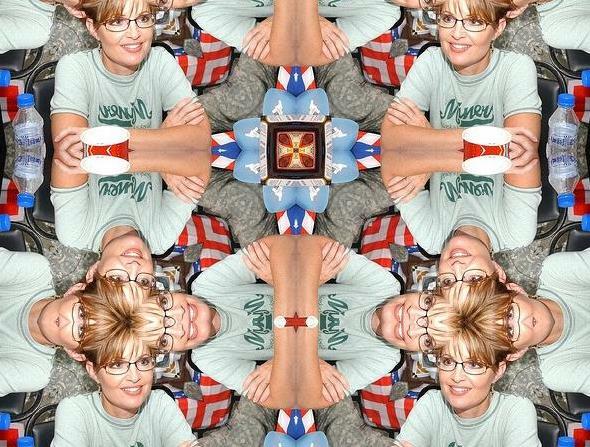 Sarah Palin is the most entertaining politician in the world. Today’s resignation speech was straight out of a Tom Robbins novel. Brilliant, free-wheeling, stream-of-consciousness poetry. If she is really about to be indicted by the feds, I am really going to miss her. JibJab rules the tubes. The best animators on Earth have now created a Barack Obama Superhero masterpiece. Enjoy. Iran is won, it is only a matter of time. The first segment of the Rachel Maddow show last night was one of the most inspiring things I have seen. It gave strong evidence that the opposition movement in Iran is on the verge of victory. It was so good that I want to re-phrase it in my own words. It started with the eight Iranian soccer players that wore green accessories to show their support for the movement. There were words about their courage, and the risks they were taking. There was coverage of the marches, including one of the most amazing protests I have ever seen on film. There were no chants. They marched in silence. They were totally coordinated and controlled. When the state police riot squad showed up, they passed the word quietly. They did not throw rocks. They did not hurl insults. The guest explained the inner workings of Ayatollah politics, and that was the thing that convinced me that this battle is won. He said that the days of mourning that are beginning today mark a tidal wave that will not be quelled. The protestors that have been killed so far will be honored as martyrs. There will be more deaths today, and another day of mourning tomorrow. And so on. And so on, until the government is overthrown. Perhaps the most amazing part was the fact that Ayatollah Khamenei is pretty low on the spiritual totem pole when it comes to power from God. One of the Ayatollahs above him has made it a mortal sin to fix elections. Another is supporting the opposition. The guys that are closest to God seem to be ready for a change. Anyway, that’s my version of Rachel’s amazing show. Click the link and watch it if you missed it last night. It’s a great day to be a freedom fighter. 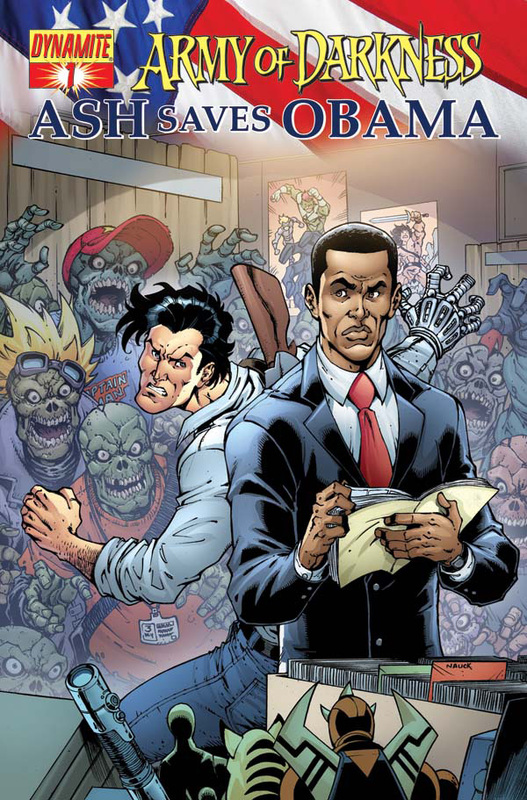 President Obama appears in upcoming Army of Darkness Comic Book. RETAILER INCENTIVE #1: FOR EVERY 10 COPIES ORDERS, RETAILERS WILL RECEIVE A BLACK AND WHITE SKETCH EDITION OF THE TODD “SPIDER-MAN #583 PRESIDENT OBAMA ARTIST” NAUCK COVER! RETAILER INCENTIVE #2: FOR EVERY 25 COPIES ORDERS, RETAILERS WILL RECEIVE A NEGATIVE ART EDITION OF THE TODD NAUCK COVER! ALSO AVAILABLE: FOIL EDITION AT THE NET COST OF $10.00! He’s faced them all, but Ashley J. Williams is about to face the greatest horror of his entire deadite-kickin’ career – a comic book convention! But this ain’t any ol’ comic book convention, this one features a special appearance from the President of the United States of America – Barack Obama! How do things go from there when Ash and Obama are in the same place at the same time? And did we happen to mention that the Necronomicon is there doing the thing it does best – turning ordinary humans into the demon possessed undead! This special Army of Darkness mini-series event is written by Elliott (Army of Darkness/Xena) Serrano, illustrated by Ariel Padilla and features covers by Todd (Amazing Spider-Man) Nauck and a Surprise Guest Artist! President Obama has announced his first pick for the Supreme Court. 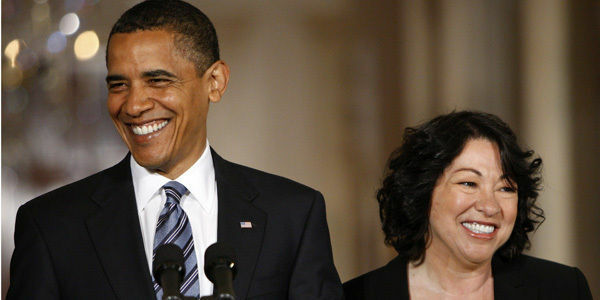 Sonia Sotomayer would be the first Hispanic to sit on the biggest bench in the land. “My heart today is bursting with gratitude,” Sotomayor said from the White House podium moments after being introduced by Obama. Another Obama in Marvel Comics: Bo joins the Pet Avengers in August. They’ve been up/down/around/about/forward/backward. They’ve gone to the jungle/ocean/Central Park/outer space. They’ve scratched/pawed/clawed/gnawed their way throughout all existence, ALL for this moment! 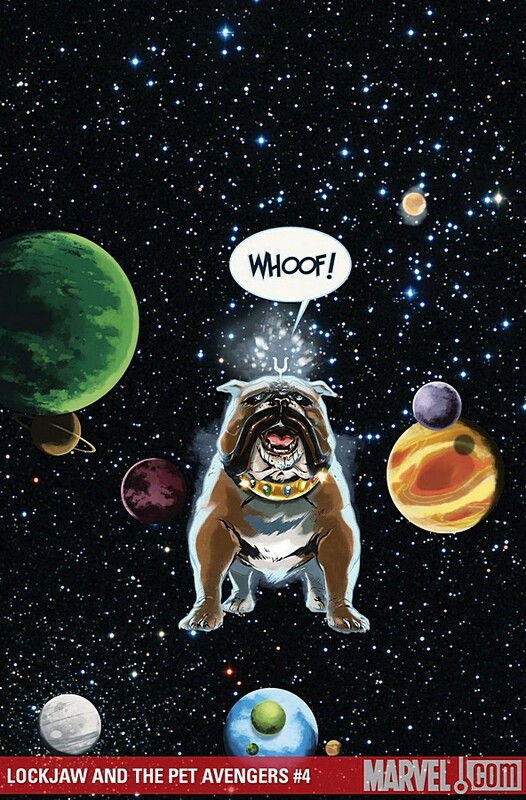 Now they’ve FINALLY found all of the Infinity Gems…so what’s a moon-puppy to do when he’s given all the power in the universe? Featuring a VERY special presidential puppy appearance! 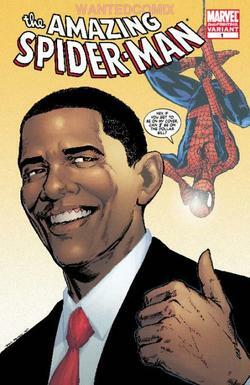 This will be the third appearance of an Obama in the official mythology of superheroes, following a Marvel team-up with Spider-man and a DC Comics Superman costume change. 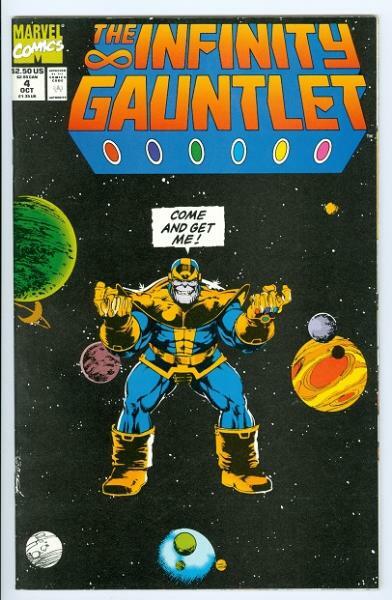 Those Obama guest spots will follow, right now I need to show you the 1991 Infinity Gauntlet cover to which Lockjaw is paying homage. Whoof!